I have breast cancer. I was diagnosed just before Thanksgiving. I had surgery in December, started chemo last Friday, and am looking at at least another five months of active treatment before spending a decade on estrogen blockers. It is bananas. 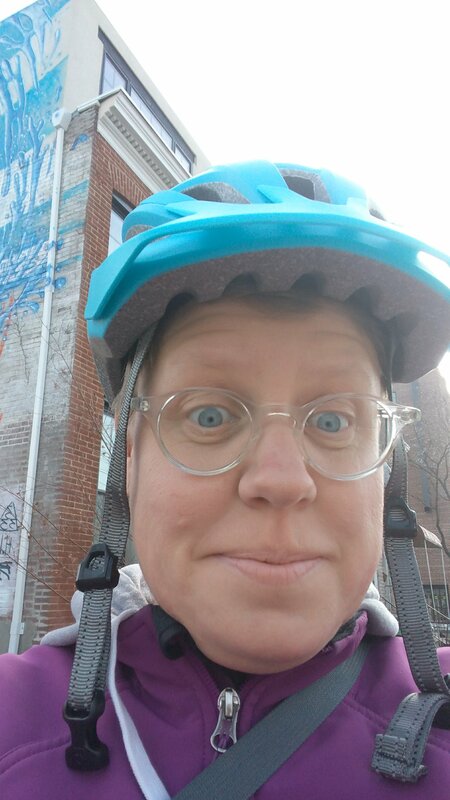 It took a minute to recover from surgery enough to ride a bike, and now I’m tired, worn down, and my whole body aches like somebody beat it with a baseball bat thanks to chemo–not optimal bike riding conditions. But today I took the bike out for the less-than-a-mile ride to R House in Remington for lunch and the a dance class. It wasn’t easy, but I did it, and it made me weep, this reminder that I am still myself, and I will still be myself. That’s what I saw riding my bike around today.